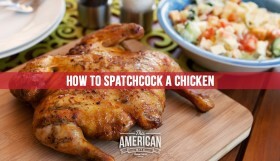 I’ve been on the quest to find the perfect roast chicken. 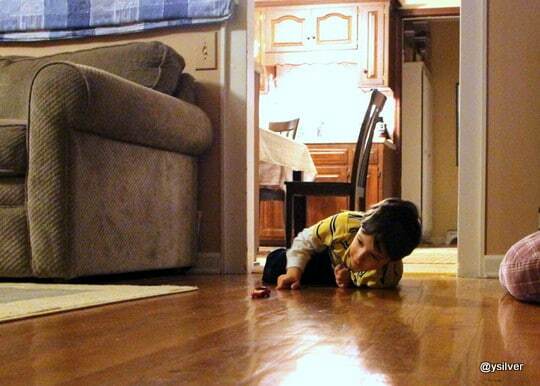 I am getting close. The wonderful thing about the perfect roast chicken are the perfect drippings that collect under the bird. Always think about collecting that liquid before it sets, store it in a mason jar in the fridge. Nope, this recipe is not about gravy. It’s about rice. Not just any rice. Chicken-y, delicious dirty rice that will become the stuffing for my locally grown acorn squash. 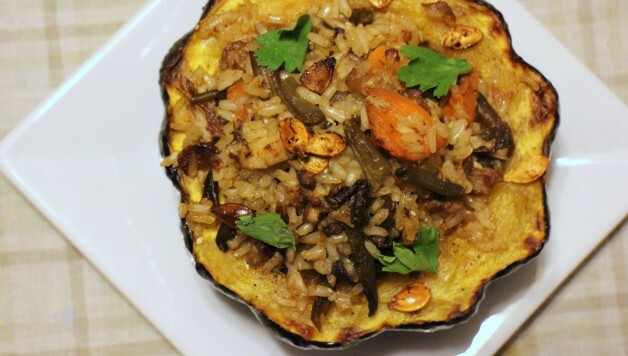 This recipe is a really inspired by the millet stuffed squash I shared earlier in the year. The best flavors are really reached from having the right leftover ingredients in the fridge. These are not ingredients I would set about to make for this dish, but you could. 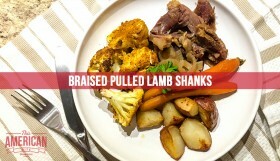 After all, this is a delicious one-plate meal, perfect with a glass of cabernet sauvignon on a cold winter evening. Dirty rice is traditional a Cajun dish. In my opinion there need not be a recipe for dirty rice. 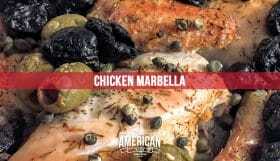 You can make something reminiscent of the traditional dish with whatever leftover meat or veggies you have. This is why dirty rice is similar is parts to my my breakfast bibimbap. When cooking the rice, I like to replace a third of the water or stock with the liquid I collected from my roast chicken. You can also use veggie stock or chicken stock if you’d prefer. The other secret ingredient in this dish is the leftover lamb bacon from my KOL Foods Healthy English Breakfast recipe. It added a delicious smoky note to the rice. 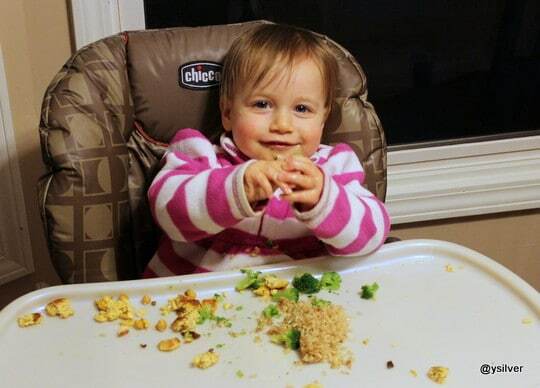 You could eat the rice as is — which my daughter decided was the best plan of the evening. 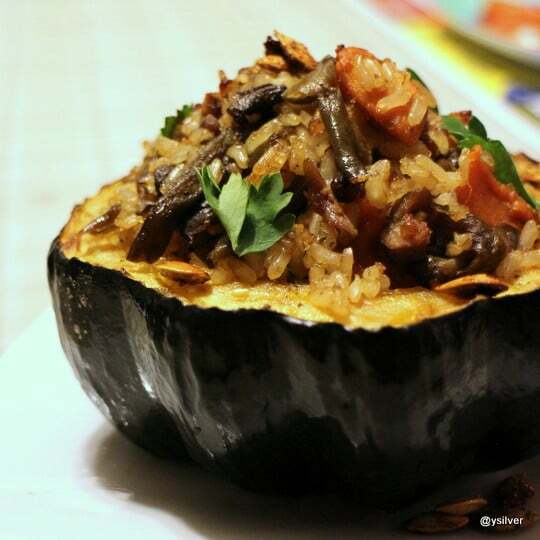 For our dinner though, the dirty rice was the stuffing for our acorn squash. I preheated the oven to 425 degrees, cut the squash in half and saved the seeds so they can be toasted and used as garnish or instead of croutons in soup or salad. You want the squash to be mostly cooked before you stuff it so set the timer for 20 minutes (which happens to be the perfect amount of time to play race-cars). If you’d like a little extra color on the top of the squash, put the broiler on low for a couple of minutes before you add the dirty rice. 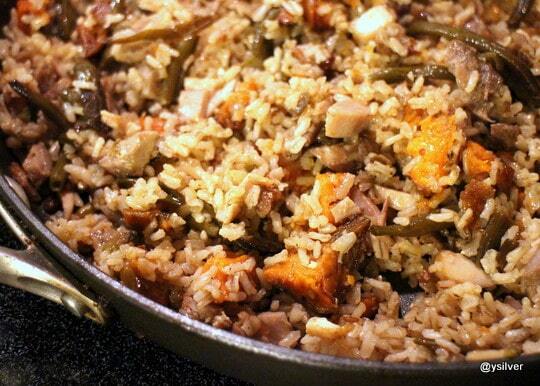 It will add a touch of color without drying out the dirty rice. If you look closely you can see how I scored the squash gently with the tip of a knife. Once stuffed, bake it a little more. It only needs about ten more minutes so if you need to to change a diaper, read a bed time story or two and say good night to the kids, reduce the heat of oven so you don’t burn the squash or dry out the stuffing. When you return, your dinner will look something like this. Use these ingredients to serve two (two people per squash). 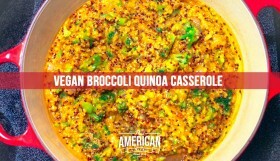 I’m sharing the ingredients I used, feel free to substitute for similar ingredients, this dish is not a science and would work well with quinoa or millet if you’re not into rice. 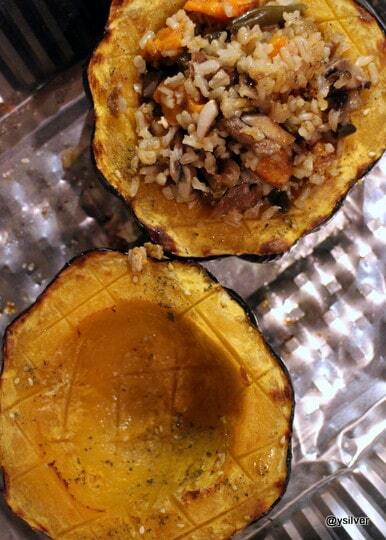 If your halves of acorn squash do not sit in a baking pan, turn them over and cut a small amount off of the rounded bottom so there is a flat end for it to sit on. Heat a large skillet, add a little extra virgin olive oil, dice any vegetables that are not cut up and add them to the pan. Dice the chicken and the lamb bacon, and add that to the skillet too, then the cooked rice. Season with a touch of salt and pepper. If you’re using leftovers like I was, everything is likely seasoned already so more salt or seasoning may not be needed. 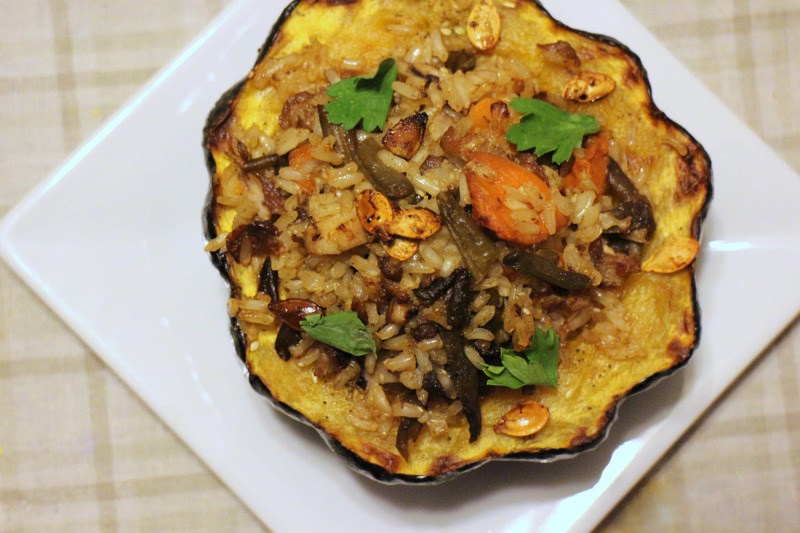 Allow the rice to heat thoroughly, then turn to a low temperature to keep warm until your squash have been roasting for at least 20 minutes. 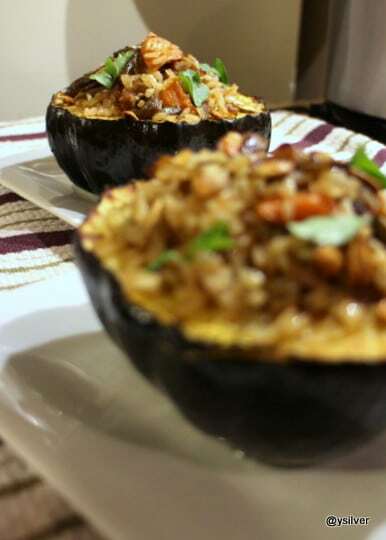 When the timer rings, remove the squash from the oven spoon the dirty rice into the middle and return to the oven for eight to ten more minutes.